The thing that I love most about Italian salads is that at its heart, it’s a celebration of a small handful of ingredients. They’re prepared in such a way that they really make you think about what you’re eating, and perhaps, lend you a finer appreciation of some of the best things in life. That’s no small accomplishment. Too often, meals are just ‘sustenance’. We don’t stop and think about WHAT we’re eating. A well-prepared meal is a welcome break from the cares of the day. When you have vegetables such as the young, sweet zucchini that’s abundant at this time of year, it becomes even easier to focus on life’s simple pleasures … particularly those that revolve around food. A little mindfulness never hurt anyone. Take time. Savor the look of your plate, the aroma wafting to your nostrils, and the pleasure of your contentment as you take your first bite. And perhaps, after a delicious meal, the ways of the world may seem a little more bearable. This is a delicious salad or first course, and takes almost no time to make. 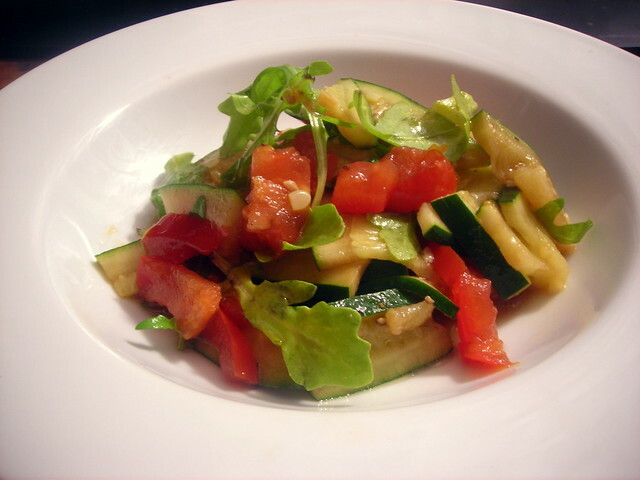 Choose ripe tomatoes and firm, young zucchini, so that they will be at their most flavorful. As a side note, do you like the truncated recipe instructions that I’ve been writing for the past few posts? These don’t list quantities or proportions, as I leave it up to the reader to decide how much to use (unless otherwise noted). The recipe will work for the most part, unless one goes to extremes. If you need precise instructions, please leave a comment below and I’ll answer. Thank you. Simmer zucchini in lightly salted water, then blanch in ice water, then drain. Combine with chopped tomatoes and baby arugula. Taste for salt and pepper, then dress with extra-virgin olive oil and 1 teaspoon vinegar (white wine vinegar, balsamic or sherry vinegar). Serve at once. Time: About 20 to 30 minutes, including prep. 22 Aug	This entry was published on August 22, 2012 at 7:54 pm. It’s filed under cooking, food, food photography, Gluten-Free, Italian food, summer, vegan and tagged appetizer, food photography, gluten-free, Italian food, salad, summer, tomato, vegan, zucchini. Bookmark the permalink. Follow any comments here with the RSS feed for this post.